• 1st- CPOs not on duty (New Year’s Day). • 2nd- CPO injured whilst trying to detain shoplifter. Offender is known and got away, goods was recovered and given back to store. £120.00. • 3rd- CPOs assisted a male back to the bus station as he was feeling unwell and refused paramedics. • 3rd- CPO’s working with CCTV to catch an offender who threatened a security officer with needles whilst being removed for attempt from store. Female headed for the Quays on a bike. CPOs met up with known female, given her advice not to threaten staff again. CCTV informed the female had dumped her bike down an alley. CPOs investigated and found the bike and bag for life containing numerous toilettes items. • 4th- Member of Public approached CPOs reference 2 females approaching elderly people for money in the City. CPOs located the females and detained them in B&M. Police attended and arrested for fraud as they were not a registered charity, money being obtained for personal gain. • 4th- CPOs caught wanted male for shoplifting. Shoplifter was detained until police arrived and arrested male. • 5th- CPOs were asked by CCTV to observe a vulnerable male on Northgate Street until police arrived on site. • 5th- CPOs helped with an issue in The Cavern with a young male causing issues. • 6th- CPOs identified a known shoplifter from store CCTV. Stolen £50.00 worth of goods as soon as they opened in the morning. • 7th- BBC points west filming CPOs (Promoted on Points West 6.30pm). • 7th- Well known shoplifter left a store without paying for goods, followed by CPOs and CCTV. Male was arrested on Barton Street by police. • 7th- CPOs located a wanted male. CPOs detained the male and waited until police arrived. Male recalled back to prison. • 8th- Male detained for shoplifting- reasonable force used by CPOs as a dirty needle was produced to make threats on CPOs. Police arrived and arrested the male. • 9th- Vulnerable female passed onto CPOs. Threatening to take her life. CPOs contacted the police and took the female for a coffee whilst waiting for the police to arrive. • 10th- Group of males drinking alcohol outside Paddy Power on Southgate Street- CPOs reminded the males of the PSPO within the city. The males left the area apologising. • 12th- New offender stole items from the quays and was stopped by CPOs in the city, with the help of CCTV. All items were retrieved. Yellow card issued. • 13th- CPOs monitored a male in the city accused of harassing females. CCTV informed. Male then approached another female in front of CPOs. CPOs could see the male was intoxicated and advised the male to leave the city. Monitored leaving by CCTV. • 14th- CPOs helped deter 5 known shoplifters out of a CitySafe store within 1 hour. • 15th- CPOs retrieved a total of £1,149.89 in one day. All offenders known on City Safe, profiles updated. • 16th- CPOs helped City PCSO with vulnerable female on top of car park. • 16th- 2 new offenders (out of area) detained for stealing £493.50 worth of stock- both arrested by police. • 17th- CPOs attended ASB Street Aware meeting. • 19th- CPOs dealt with altercation in City Public House. CPOs attended, calmed the situation down and waited for police to arrive. • 20th- CPOs located missing child. • 20th- CPOs stopped a fight in Cathedral grounds. CCTV informed and monitored. All details taken. • 21st- CPO’s dealt with a vulnerable female, took her to place of safety, handed over to the police. • 22nd- Well known Cheltenham offender deterred in Store. Offender seen concealing goods, items dumped before leaving the store. Police and Loss Prevention stopped female on St Aldates St. CPOs issued a yellow card and explained the rules of shoplifting within the city centre in Gloucester. • 23rd- Excluded offender spotted by local PCSO in a member’s store. CPOs removed male from store. CPOs passed male onto CCTV. Male seen leaving the City. • 23rd- Visit to the student accommodation in City. Spoke to some students reference smoking illegal substance onsite. • 24th- Eastgate shopping centre reported a fight breaking out on Eastgate street. CPOs responded CCTV monitoring. CPOs separated the fight took all details. Police arrived no arrests made. Offenders left the area. • 25th- CPOs spoke to persistent beggar on Eastgate street, known to CPOs. CCTV monitored Beggar seen leaving the City. • 26th- CPOs located missing 14-year-old. CPOs took person to place of safety whilst waited for the police attendance. CPOs handed over to the local PCSO’s on duty. • 27th- Male stole some items from a store within the City on Southgate Street. Male was chased by the CPOs. Male dumps the goods on the floor. CPOs retrieved goods and took them back to the store. Male was unknown to CPOs. • 28th- Store passed over a known shoplifter leaving their store. CPOs monitored the known offender who enters another store. CPOs spotted a selection and concealment, offender then leaves the store. CPOs stopped the offender and returned all goods back to store. Passed on to CCTV, left the city centre. • 29th- Observations for a male wanted by the police. Male seen on Southgate street by City Safe Member. CPOs asked CCTV if they wanted CPOs to stop and detain the male. CCTV granted. CPOs locate male and detained him in Store holding room. Police arrived and arrested the male. 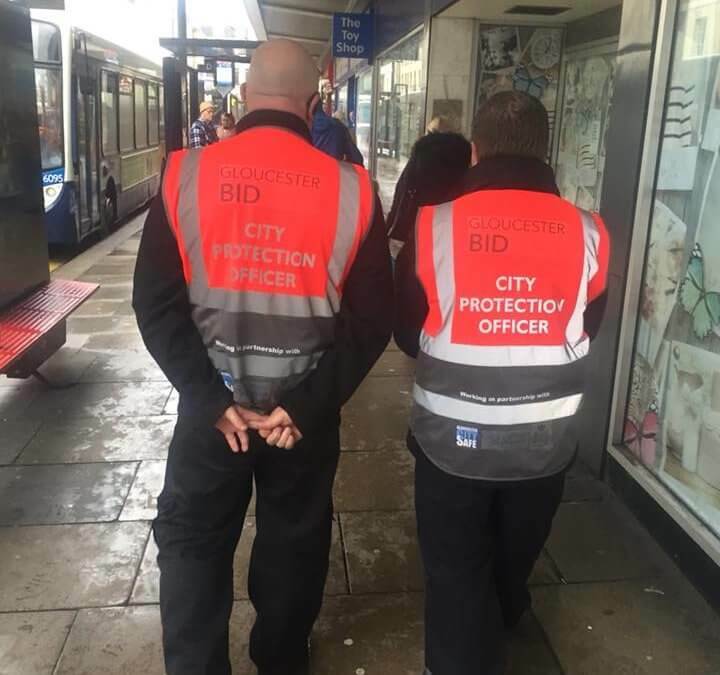 • 30th- CPOs alerted that 2 males were completing surveys on Eastgate Street without permission from the Council- CPOs approached males who were completing a survey on Gas and Electricity. CPOs booked male in with Eastgate Market – all in order. • 31st- CPOs help store with detaining 2 shoplifters £50.00 today and £500+ trolley push out previously on two other occasions. Police contacted. Police unable to attend due to major incident.